Singha Beer [pronounced ‘sing’], the original beer of Thailand, is returning to the Street Food Circus Night Market in Cardiff for the third year running with its own Asian inspired area, named ‘Singha Street’. Within this vibrant space, the Singha Street Bar will be serving chilled Singha Beer from an authentic Thai bar. The event is open every Thursday to Sunday from 25 August until 24 September 2017. Foodies visiting Singha Street at the Street Food Circus will be able to enjoy delicious Thai food from Brother Thai and other food vendors, which are perfectly complemented with a Singha Beer. 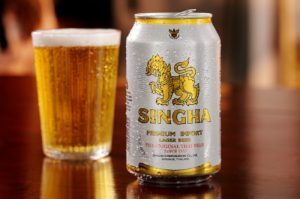 Singha Beer was created using a blend of sweet, earthy and spicy flavours to compliment the spectrum of tastes in Thai cuisine, which makes it the perfect beer for food enthusiasts to pair with the authentic Asian street food available during the six-week night market. The Singha Street Bar is open from 6pm – 11pm on Thursdays and Fridays, 2pm – 11pm on Saturdays and 12pm – 6pm on Sundays from 25 August until 24 September 2017.